Let’s vote for the most wanted pendant from these 4 popular pendants! in New Shining version! with Better Ability! if you buy 88-diamond set in this period, get A+ Popular Pendant Piece immediately! (1 time only)... You can upgrade this A+ Pendant Piece to S and to S+ as the MAX level! Let’s VOTE what you want! 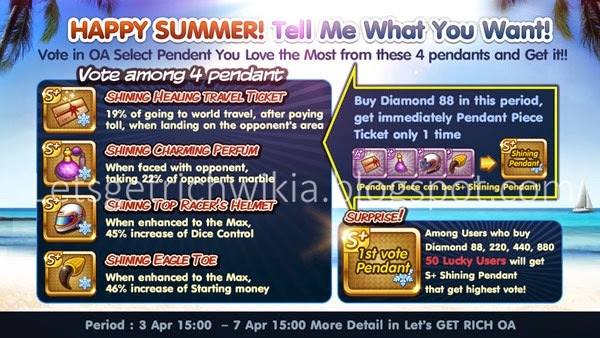 And Let’s buy diamonds this time to get special reward and chance to get S+!